I am not a fan of pizza, hence why the first time I'd ever made it at home was recently with Miss Abigail. I'm not sure why - I love bread, I love cheese and I love all the toppings. I think it's something to do with that faint tomato-sog you get on some pizzas - especially home made ones. For someone who claims to love food, I can be 'a right fussy cow' as I was recently told. A friend had bought cakes to work for his birthday. Someone stole the eclair before I got there, meaning a box full of cream doughnuts left me cold. There were more custard tarts than I've ever seen in my life. Not for me. Although I've never had one so they might be lovely. I inherited my phobia from my mother's fear of cold custard. So that left me with a jam doughnut. Which suited me down to the ground. But I'm now labelled as a cake snob as Morrison's finest was not good enough for me. And only homemade will do. Not my words, but I know lots of people who'd agree with that. Which brings me back to last night. 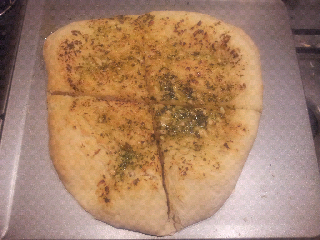 Whilst I don't like pizza, I do love garlic pizza bread. There's a restaurant on the Isle of Wight which we frequented BC (before child) which makes the most amazing garlic pizza bread. The pizza bread there is served as a starter and is so huge that even sharing with someone else means you're so stuffed afterwards that you only manage a few mouthfuls of your mains. I got the recipe for today's pizza base from Jamie at Home (think this is the same recipe online) and I only made a quarter of the recipe. It made a lovely deep pan bread. I'd love to learn how to make thin and crispy style bread - you know the kind that has gorgeous bubbly bits in it. But I don't have a proper pizza oven so I'm guessing that's out for this current experiment. The garlic butter was my own invention - 50g unsalted butter, four garlic cloves minced, a squirt of Garden Gourmet parsley - about two tsp and a pinch of ground sea salt. It might have been too much for this size of pizza as there is now a slick of cold garlic butter that needs cleaning from the bottom of my oven. All in all a very yummy experiment - but too big for two people when served with sausage pasta. Will stick to Waitrose's garlic baguette for its simplicity unless I happen to be making bread or having guests.